(Newsbusters) This year, two countries held significant votes on elective abortion. But the networks only covered the aftermath of one of them – the country that voted for abortion. On Aug. 9, Argentina’s Senate voted against a bill that would have permitted elective abortions up to 14 weeks. Nearly three months earlier, on May 25, Irish citizens voted to repeal their country’s ban on elective abortion to clear the pathway for abortion up to 12 weeks. The three broadcast networks – ABC, CBS, NBC – only covered the Ireland vote during their morning and evening news shows. While ABC, CBS, and NBC didn’t mention Argentina, other big name outlets found the country’s vote newsworthy, from The New York Times to The Washington Post. Other outlets, like The Atlantic and The Guardian, noticed the comparisons between Ireland and Argentina. Still, the networks only reported on Ireland. And not only did the networks report it, but also they applauded it as a “historic” vote and “women’s rights” win. 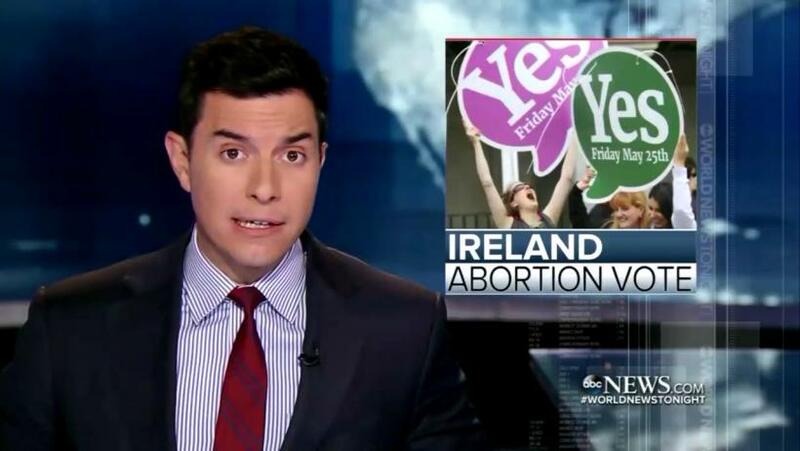 ABC weekend anchor Tom Llamas reported on the “historic vote” with the “final tally showing overwhelming support for women’s reproductive rights” during World News Tonight May 26. Methodology: MRC Culture searched for the terms “Ireland AND abortion” from May 25 to May 30 and “Argentina AND abortion” from August 9 to August 14 in Nexis transcripts from the morning and evening news shows of ABC, CBS, and NBC. No results showed for Argentina. Editor’s Note: This article was originally published at Newsbusters and is reprinted here with permission.